As the Christmas season approaches, the Poinsettias are for sale everywhere. Quite a few of us buy them every year. I tend to buy them just before Christmas, if I buy them earlier, I end up with a plant that has a few leaves at the top and the rest of the stalk is bare. What can we do to keep them looking nice, for a longer period. 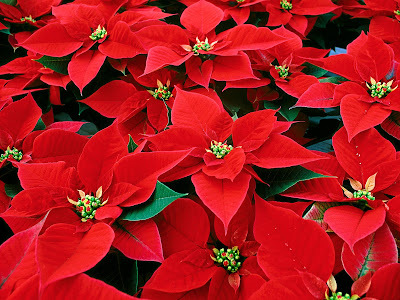 First of all a Poinsettia, the Latin name is Euphorbia pulcherrima, is a native of southern Mexico and the north of Guatemala. A tropical area of the world. The first time I saw them growing in the wild was on the way to Fraser's Hill in Malaysia (a colonial hill resort), much like we see Oleanders growing in the central reservation here in the Var. They must have been imported into Malaysia during the colonial period. It was quite stunning, rows and rows of them. The red bracts (modified leaves) and not the flowers make the plant so attractive. The flowers are in the centre of the red bracts. Nowadays through hybridisation Poinsettias range in colour from red to white. When choosing a Poinsettia make sure the flowers in the centre of the bracts are still closed, which means the plant is at the beginning of its cycle. During transport from shop to home make sure the plant is well wrapped, Poinsettias do not like big difference in temperature. Place the Poinsettia near a sunny window, room temperature max. 22 degrees C, dropping to 15 degrees C. at night. Avoid too much variations in temperature. Do not let the leaves touch the windows. Only water the plant whenever the surface feels dry to the touch. Water until it drains out of the bottom, but do not let it stand in water. In nature Poinsettias grow in a tropical climate, they like humid conditions. If your living room is too dry, you might find you have to water the plant daily. At the end of the winter the coloured bracts will drop. Keep watering as mentioned above till March. In April, gradually decrease the watering, allow the plant to get dry between watering periods. After about 2 weeks of the drying out period, move it to a cool spot, never less than 15 degrees C.
In mid May, cut the stems back to about 4 inches and repot in a slightly larger container, with new soil. Water it well. Place it in room near the window with temperatures around 22 degrees C. Continue watering when plant feels dry. Once new growth appears, begin fertilising. In June the Poinsettia can be placed outside in a shaded location. In July pinch back the new growth by 2.5 cm, to encourage the plant to branch out. Do the same in August. When the weather gets colder bring the plant inside and place it near a window. In October to create the colourful bracts the plant needs to be kept in total darkness from 5pm to 8am each day for 8 weeks. During the day place the plant again near a window and continue with the normal watering and fertilising. End of November, stop creating the total darkness, place the plant near the window. December, stop fertilising about December 15th and treat it as you did when you first bought it.